Another classic, this bobble stitch bag is a great project for the beginner that wants to try something new. 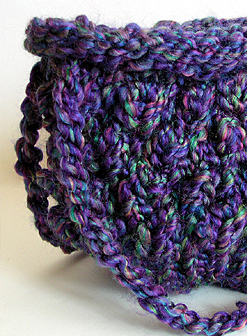 The bag pictured uses 2 strands of Lion Brand Homespun yarn. Color pictures and detailed written instructions are included in the pattern. Stitch Techniques: E-wrap, purl, bobble stitch, gathered bind off, and flat panel bind off.